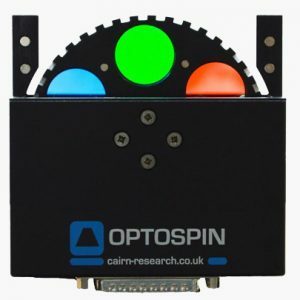 The Cairn OptoSpin – More than just a filterwheel! At Cairn we’ve been involved with filterwheels for rather longer than we care to remember, but it has nevertheless taken us a while to develop our latest offering, in the form of the Optospin. That’s because there was a fair amount of technology that needed to be incorporated into this little beast. One clue here is in the name, since the Optospin can indeed spin continuously as well as moving discontinuously between filter positions, and this mode of operation confers a number of advantages that we’ll come to in due course. But there’s quite a lot else hidden in there too, as you can find out if you read on. That’s why we describe the OptoSpin as “more than just a filterwheel”, so let’s see if we can convince you! The photo above shows the various filter wheels that we've designed over the years. The first two were for research purposes, when Martin our Chairman still had pretensions of being some sort of research scientist, with the first one being driven at high speed by compressed air! The subsequent ones show the various designs from the commercial Cairn era. Two wheels are better than one! Right from the start, the Optospin was designed as a multiwheel product. As the following paragraphs should show, there are all sorts of advantages in being able to drive more than one wheel from a single controller. The internal architecture actually supports up to four wheels, although we have yet to be asked for that number (but maybe one day?). In practice the main requirement is for systems with one or two wheels, which our standard controller can support directly, and this seems to be suiting people very well. Although the Optospin is a general-purpose product, and is designed to be as versatile in use as possible, it was nevertheless developed specifically with microscopy applications in mind, for which there are some potentially very demanding requirements in respect of speed and mechanical stability. The problem here is that these two requirements conflict, and the achievement of the best compromise has pretty much dictated our design approach. The “traditional” method of filter changing is for a filterwheel to remain at rest at a given filter position for some required period, to allow data for that filter to be acquired, and then to move sequentially to as many other filter positions as may be needed to acquire data for those as well. If you are in no hurry, then that’s no particular problem, but when shorter data acquisition times are desirable, then the time to move between filters becomes relatively more significant. But here is the trouble. It is generally most convenient to mount the filterwheel directly to the microscope, but since the microscope may be viewing samples at a resolution of a micron or less, these measurements are going to be correspondingly susceptible to any source of vibration. And a discontinuously moving filterwheel is an excellent source of vibration! The issue here is the nature of the movement, as the wheel has to accelerate and then decelerate to go from one filter position to the next. This requires the generation of turning forces, or torques, as the wheel is literally pushing against the microscope in order to change its position, first in one direction as it accelerates, and then in the other as it decelerates again. Specifically, the wheel has a certain inertia, and the higher the inertia, the more it’s going to push back against the microscope whenever it changes position. So clearly, whatever else we do, we want to keep the inertia of the wheel as low as possible. That means making it thin, and making it light, but especially to make it as small as possible. Whereas the inertia increases “only” linearly with respect to thickness and density, it increases with the fourth power of the diameter, so size – or lack of it – really does matter here. It would therefore in principle be nice to use really small filters, but in practice anything smaller than the standard 25mm size would greatly restrict the potential applications, so that is what we have chosen for the Optospin. Instead we have used a relatively small number of them in order to keep the size down, and for which six is the obvious choice by the time you have allowed space for an axle and bearings – and in fact in our design for the motor as well, which just sits in the hub. This allows a small overall size for the wheel and its housing, of just 100x100x35mm, which makes its incorporation into any optical system correspondingly easier. The other thing we can do – although we may not want to – is to move the wheel more slowly between filter positions. The faster we want to do this, the greater the required acceleration and deceleration forces. In this case, to halve the time requires four times the forces, but in practice everyone seems to be in a hurry here, so although the OptoSpin control software does allow you to “turn down the power” if you want, we have come up with a much nicer solution that we’ll get to in a moment. But will six filter positions be enough? Perhaps not, but the Optospin design effectively allows you to have TEN filter positions, as the wheels can be mounted in overlapping pairs but within that same optical pathway space of just 35mm. In this configuration each wheel will have one open position, so that only one filter need ever be in the light path. Driving this to simulate a single ten-position wheel might sound a bit messy, but we’ve included a control mode that does everything for you, to make it look like there is just a single ten-position wheel. This approach is always going to be faster than the equivalent physical version, and allows us to achieve a worst case stepping time (each wheel doing half a rotation) of just 50 milliseconds. Or of course you can also control the two wheels independently, for those possible applications where you do need two filters in the light path at the same time. The paired-wheel approach doesn’t just give you more than six filter positions though. It can ALSO greatly reduce the vibration, by having the two wheels simultaneously stepping in opposite directions, so that their acceleration and deceleration torques cancel each other out! The preferred mode of operation here is to have just six filters in total, but shared between the odd-numbered positions in one wheel and the even-numbered positions in the other, so there will always be one filter in the light path. Again our control software allows you to drive this combination as if it were a single wheel, which makes everything very straightforward. It also makes a very nice demonstration for exhibitions, so we’ve recently tended to make it a feature at the Cairn stand. If you step a single unattached OptoSpin, the associated torques make it jump around in a most impressive way, whereas the dual configuration just quietly sits there as if nothing is happening at all. Do come and see for yourself if you have the chance! A potential problem for the future is that both the field of view through a microscope’s camera port and the size of camera sensors is tending to increase, to the extent that 25mm filters may no longer always be sufficient for imaging applications. We therefore have a potential design for a larger OptoSpin that takes 32mm filters instead. This will necessarily have a higher inertia, so the paired-wheel approach will be relatively even more advantageous here. But what about continuous spinning? The foregoing should have made it clear that the vibration from a stepping filterwheel comes directly from the acceleration and deceleration forces associated with the discontinuous movement. Once a wheel has accelerated to a constant speed, the only source of vibration will be from any imbalance in the rotating mass, which should be small, and which could be made arbitrarily so. Continuous spinning is therefore a potentially very attractive alternative mode of operation for microscopy imaging applications. The irony here is that Cairn have been making continuously spinning wheels for years – well, decades actually! – but these have been intended for photometry applications, where data acquisition is potentially much more straightforward than for where cameras are involved. 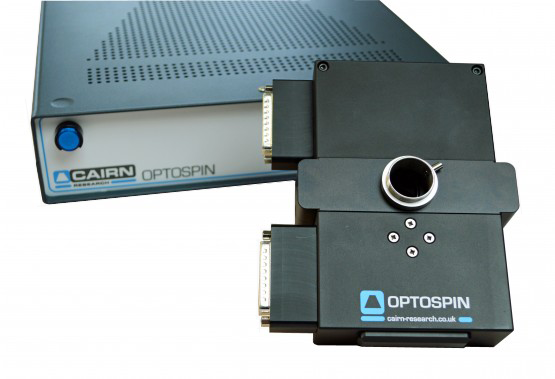 Although for imaging applications the situation is potentially more problematic, here too the OptoSpin can now provide a very nice solution. The potential problem with continuous spinning is that a given filter is sweeping through the light path as the wheel rotates, as opposed to being fully in position all the time. If (as is likely) the light path is an imaging one, this could cause vignetting problems when the filter is only partially in the light path, and also crosstalk problems if two adjacent filters are partially in the light path at the same time. The best solution to these problems is to switch the illumination source on only when a filter is effectively fully in the light path, and two things are in our favor here. First, the high-intensity solid-state light sources, whether lasers or LEDs, that are now in almost universal use, are generally so intense that photobleaching can be a significant problem, which may well preclude their continuous use at full intensity in any case, so having them on for only part of the time is perhaps necessary rather than problematic. Second, they can generally be switched on and off on microsecond or faster timescales, which are effectively instantaneous compared with the rotation speed of a spinning wheel. We can therefore arrange to switch on the light source only when a given filter is effectively fully in the light path, thereby solving both the vignetting and crosstalk issues. That’s all very well, but how would we generate the necessary control signals for the light sources? This too may sound a bit messy, except that the OptoSpin can do all this for you as well! It has programmable outputs that allow you to determine the proportion of the time during a given filter position that a signal to control a light source is present, and there are both “global” outputs for all filter positions and independent signals for each one. This latter feature opens up some very interesting possibilities for reducing crosstalk in multifluorophore applications, as a different excitation source can be chosen according to which emission filter is currently in the imaging light path. What is particularly nice here is that each camera frame can consist of a complete wheel rotation, so that from the point of view of data acquisition the entire set of excitation and emission wavelengths is captured together, but without the crosstalk from any overlap between the excitation and emission spectra of the individual fluorophores. And needless to say, the OptoSpin can generate the necessary signals for control of the camera acquisition too. The results here are pretty close to magic! For yet further control, a logic-level “shutter” input is provided, which allows control of when or whether the light source and camera output signals are generated, so the OptoSpin itself allows you to do pretty much everything you need here. In general the best approach is for the OptoSpin to look after all the timings, as it can be programmed to spin either to a specified rotation time (with microsecond resolution), or in terms of speed (with a resolution of 0.01Hz). The control is fully synchronous, in that the motor is energised at exactly the required frequency, so the stability remains absolute in respect of both speed and phase. It allows, for example, use of synchronised excitation and emission filterwheels, although disappointingly few people have so far taken advantage of this! Or the OptoSpin can be synchronised to an external frequency source if preferred, but in that case of course the speed stability can be no better than that of the source. Rotation speeds can be as low as 1Hz, and we have achieved speeds as high as 167Hz in testing, in order to claim a filter position every millisecond, albeit just to show that we could! However, our control software has become ever more sophisticated, with the provision of the programmable illumination facility for example, and not everything can work properly at that sort of speed, and where because of the acoustic effects of a rapidly-spinning wheel things get pretty noisy anyway. In practice for most imaging applications, speeds of a few tens of Hz are likely to be plenty – even 50Hz will potentially give you 300 images per second, which is beyond what most imaging software can cope with. But if you want to go much faster than that, just let us know! While we are of course delighted to offer complete imaging solutions based around the OptoSpin, we are also keen for the possibilities it offers to be as “open” to others as possible, so we have specifically encouraged third-party suppliers to support this product. 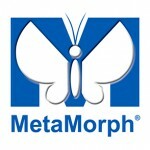 It is currently supported by both the Metamorph and Nikon Elements software packages, and with support for the VisiView software currently under development. We also have our own drivers for the public-domain MicroManager software, so there is quite a range of possibilities here. Most if not all control can be via the OptoSpin’s USB interface, either via third-party software or directly by the user, and for which a very comprehensive range of commands is provided. Interested parties can find full documentation on the Cairn website, and any further information you may need is just a phone call or email away. For most practical purposes control via the USB interface will be sufficient. However, although data transfer via USB can be very fast, there is potentially a latency of perhaps some milliseconds before this begins, which may not always be ideal. We have therefore also provided a logic-level parallel interface that allows the position of the Optospin wheel(s) to be interrogated or controlled on an effectively instantaneous basis. 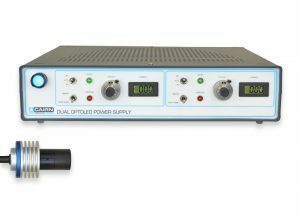 Although individual end users aren’t so likely to be using this, it is likely to be especially useful for OEM applications, which of course we also wish to encourage. This interface is also used by our optional push button control unit, which allows direct manual control of the OptoSpin – again this is something that is nice to show at exhibitions! One could certainly be forgiven for wondering whether a filterwheel that is optimised for discontinuous motion would also be able to offer fast and smooth spinning, but in practice there needn’t be any conflict here. The OptoSpin’s worst-case stepping time of 50 msec between opposite filters corresponds to an average rotation speed of 10Hz, which implies a peak speed of 20Hz, since it is steadily increasing and then decreasing during the step. Motor torque decreases with increasing speed, but much less torque is needed to support continuous rotation, so in principle a fast-stepping wheel should also be able to spin at at least severalfold higher speeds than this.